Your kids' online experience doesn't have to be dominated by the commercial worlds of Disney and Webkinz. Kids can get busy learning with engaging and informative sites that educate them about a wide range of fun and interesting topics. I'll be covering this subject regularly, but for starters, here's a roundup of 5 of my favorite sites. 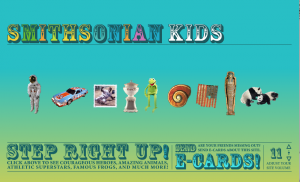 PBSKids. As you might guess, the source that provides all those seminal children's programs also offers a rich website full of games for young children. Field Guide, for example, shows illustrations of different dinosaurs, as well as nifty extras like x-rays and audio explanations. You'll find appearances from all your favorite Sesame Street characters rattling off the alphabet or hosting rhyming contests, as well as characters from other popular PBS shows, such as WordGirl, Curious George, Clifford, Barney, et al, hosting their own games. Miamiopia. Kids can customize the look of their own alien avatar (it has a striking resemblance to the Na'Vi tribe in the movie "Avatar"), then choose any type of game they want to play -- as easy as counting apples that fall from the tree to finishing a musical scale using the keyboard. Scratch. Kids can upload their own created games and projects for others to enjoy on this National Science Foundation-created site. They can make their own interactive stories, music, and art, and in true open-source, DIY fashion, share them with the world.